I rebuilt this tailgate rather than build a new one so that we could keep the Dodge letters, I do not stamp the Dodge letters in the new tailgates. 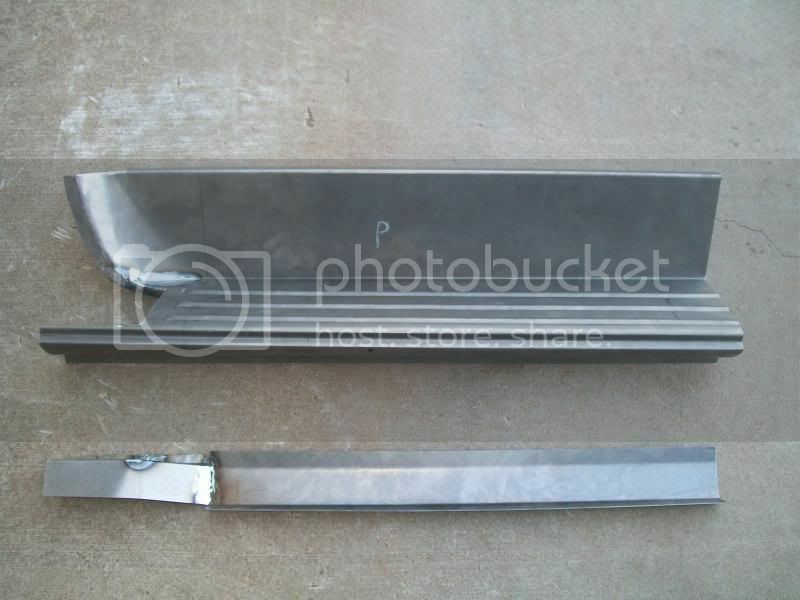 The top section of this one was dented pretty bad and the bottom section was rusted up but the section with the letters was only dented, so I hammered the dents out and cut out the damaged areas and welded in new metal that I shaped. It turned out pretty good. I finally was able to make a good pattern for the club cab rear rocker step. it is basically the same as the front but with the front few inches cut off. here are a few pictures. I hope to keep adding to the list of parts I have available for these trucks. 1961-71 Dodge Truck Disc Brake Conversion, All MOPAR! I finally was able to take my 68 D100 for a test drive with the new disc brake conversion and it was great! I had a load of drywall in the bed and the brakes stopped it with no problem. When I still had the factory drum brakes on the front they would get hot and not work very well but the disc brakes I didn't have any problem at all. I used a manual master cylinder for a 77 new Yorker and it bolted up to my original firewall holes and even the original brake lines. I was also able to use the original front brake hoses, so you don't even need to change that. 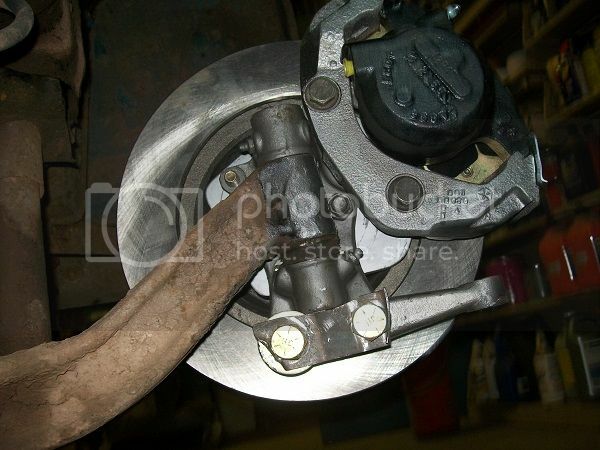 If you wanted power brakes you could upgrade to a power brake booster with no problem. I used 11.75" rotors but if you wanted to use 14" wheels you could use the smaller 11" rotor instead. Here are a couple pictures of the install on my work truck..
We have found that rotors and calipers from a 77 newyorker are easily converted to use with the 1961-71 D100 spindle. 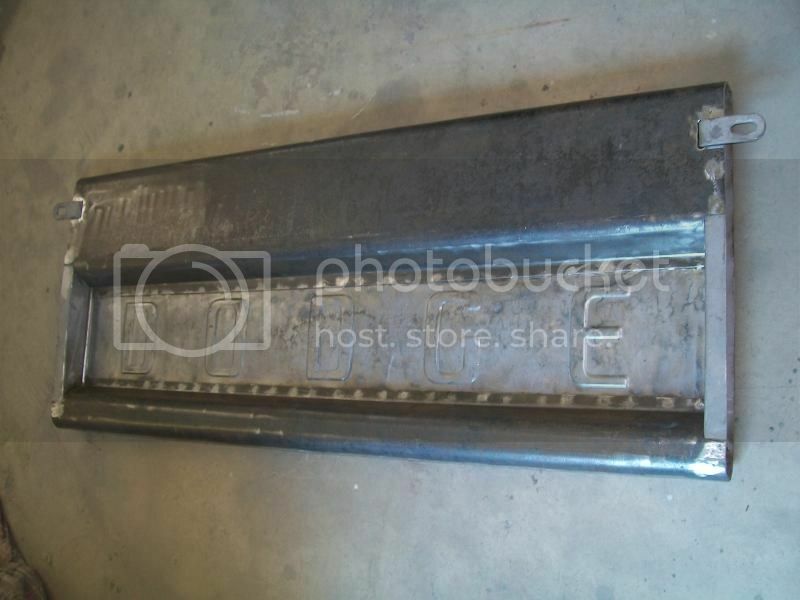 I recently came across a for sale listing for a front axle from a 71 D100 Dodge. The owner just purchased the truck and was going to do an independent front suspension conversion and did not need the front axle anymore. Somewhere in the trucks history the front brakes were converted to disc brakes. I purchased the parts and they were really well made. I was not able to find out who actually did the conversion and as far as I can find no company ever offered a conversion that used these same parts. So I completely lucked into this one except for the fact that the post office lost the passenger side spindle and parts, so I only received the driver side. 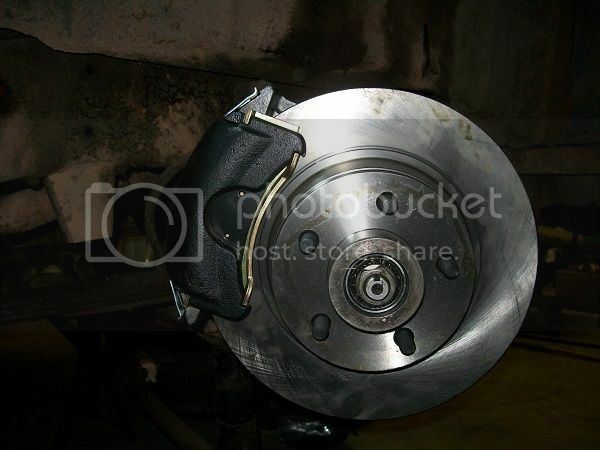 But with some research I was able to find that the brakes were from a 77 new Yorker and adapted with a simple 1/2" thick plate and a small spacer behind the spindle. The brakes work great now and I hope someone starts making them! 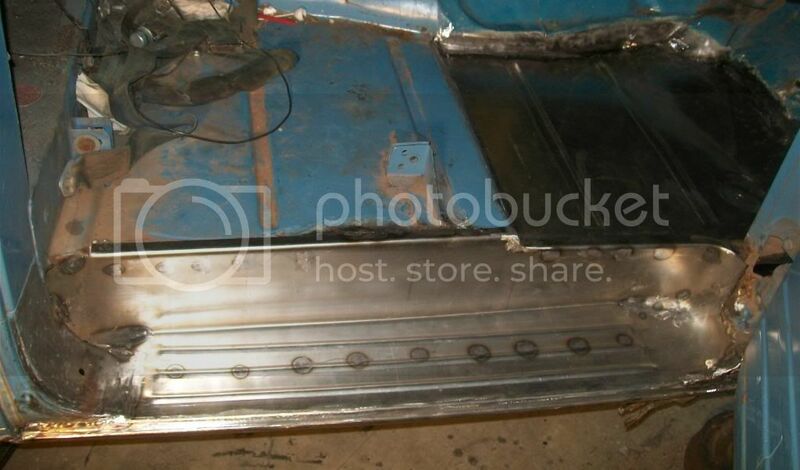 I have the floor pan and rocker step welded into place now. 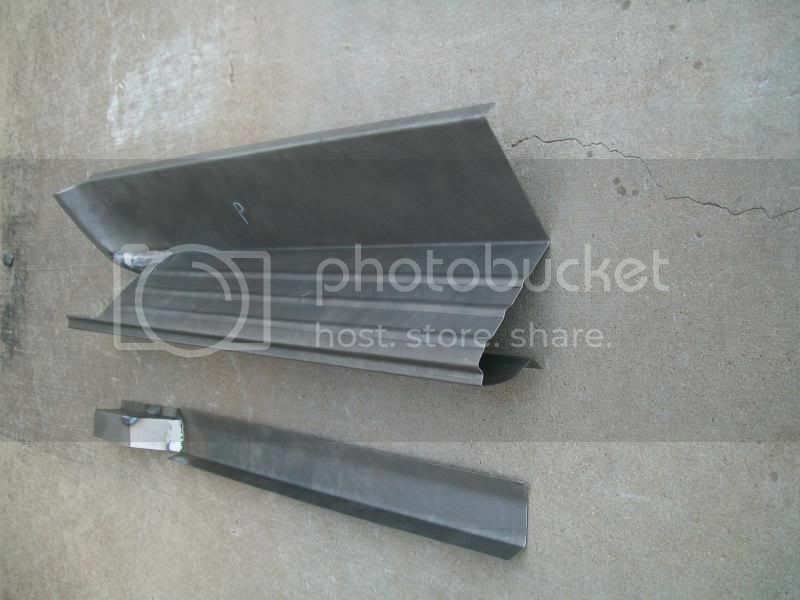 I tack welded the pan in place spacing the tacks every 1". I but welded instead of overlapping the panels, this makes a nicer finish , it looks factory when finished and will not rust out where it is overlapped. Then I welded between the spot welds at one place on each of the 3 sides that were getting welded and let it cool. After it was cool enough to touch I welded the next 1" section and let it cool . I repeated the process until all of the welding was completed. Then I used a 4" grinder to grind the welds down to almost flat and finished with a 3" grinder and a soft disc to finish smoothing the welds. I did have to clean off a lot of grease from the bottom of the floor before welding, that stuff is one way to catch your truck on fire! After the floor is painted you will not ever know the floor was repaired. The rocker step is tacked in similar to the original . 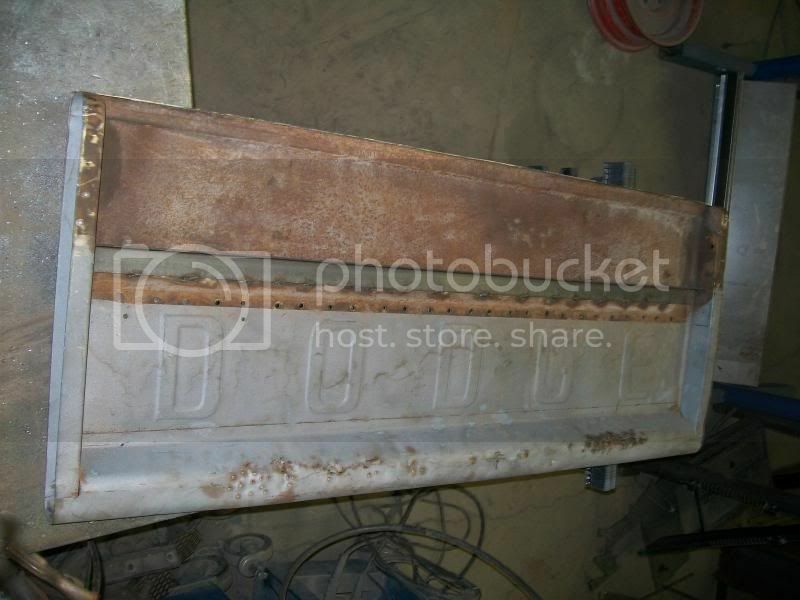 I did weld more around the rear of the step area because there was some rust in the cab that need repaired there and I wanted to make sure it was solid. 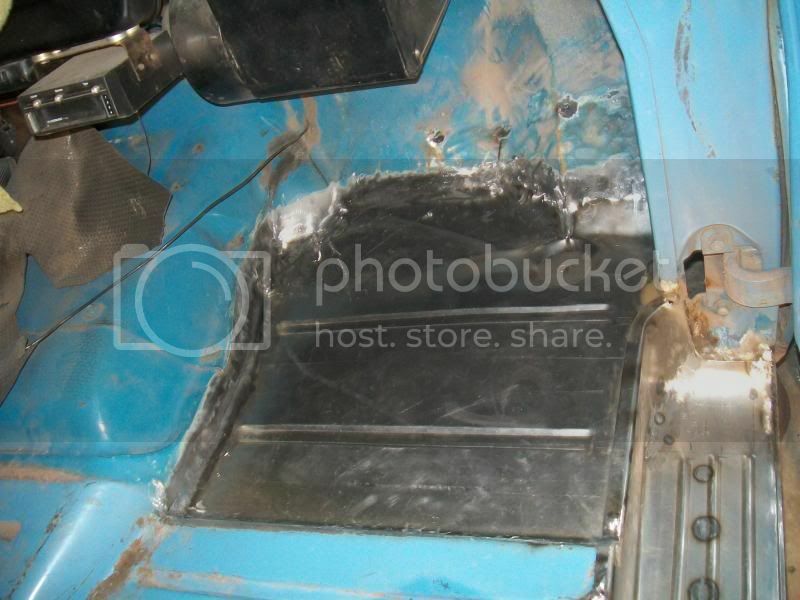 I also welded in the inner rocker at the same time. The cab mount was replaced also but I do not have it welded yet because of some more rust that needs repaired in that area. One thing for sure is that every time I start fixing rust I end up finding more rust. 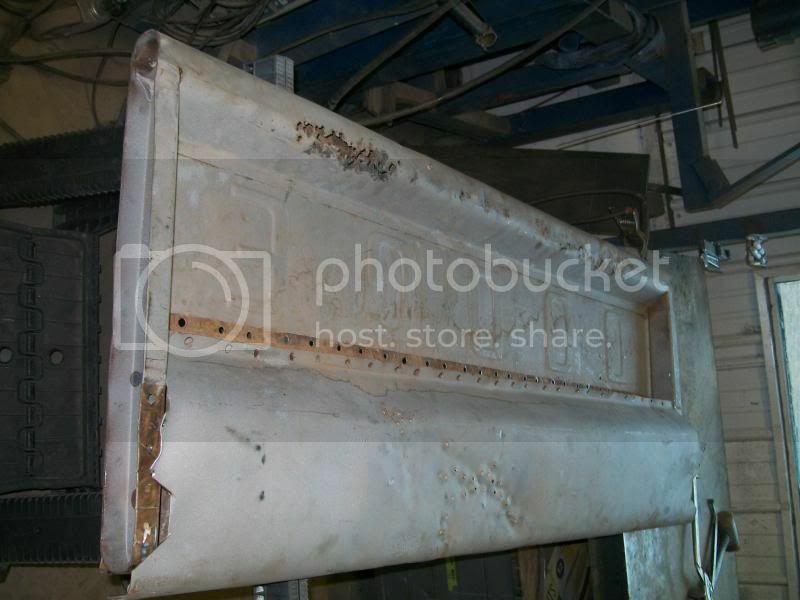 The kick panel, inner door post braces and cowl panel are rusted pretty bad also, that was not visible from the outside. And since the cab mount attaches to this area I will need to fix this now also. I wish I could tear the truck down and get it media blasted and fix it all at once, that would really be the best way to do it, but I want to be able to use it again this spring and I know I don't have the time to do it all this winter. So I am doing it the hard way one section at a time and waiting to see what rusty surprise waits for me on the next part.